Outfit: Gap light blue shrunken boyfriend shirt (chambray version), James Jeans Twiggy, ankle boots and Chanel glasses. Is it just me or am I the only one thinking it's weird to add the word boyfriend to slightly baggy jeans or shirt? How about calling it husband jeans or plain ol' loose fitting jeans? I suppose it's cool to "borrow" (I use the word lightly because according to the husband, my version of borrow is what's yours is mine and what's mine is also mine) from your other half because it's fashionable to be different. I was obsessed with getting a chambray shirt ever since I saw the tall and model like Chanel sales associate (who's also incredibly nice. Darn it) pairing it with a tweed boucle jacket from their previous Cruise collection, skinny jeans and a pair of ankle boots. It was like a revelation! Well, to me anyway. 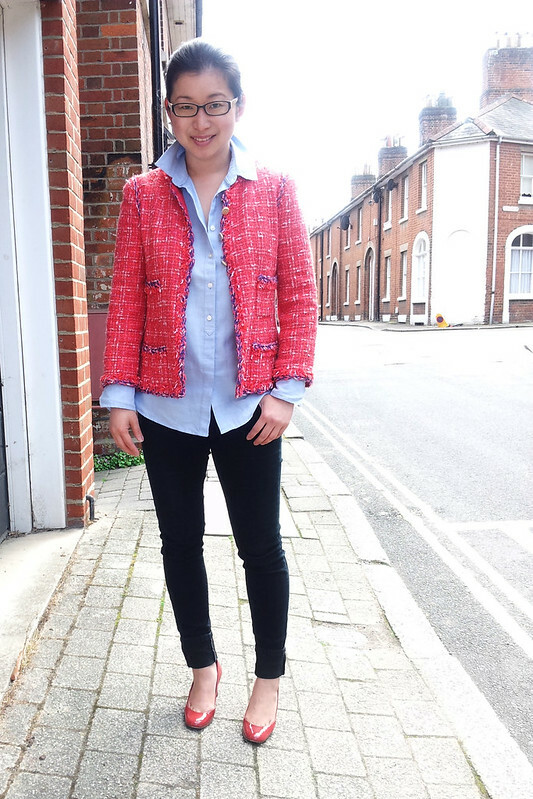 It doesn't take much to make a tweed jacket look frumpy and matronly. So the fact that she could turn it up a notch and made it look both edgy and comfortable won major points with me. I raced into Gap and tried on what I thought to be a boyfriend/husband chambray shirt and my shirtsnob hubby told me I'd actually bought an Oxford shirt instead (aaaahh.... all these big words for a shirt. So complicated!). I haven't shopped in Gap in ages because frankly, their clothes are *cough* boring and they're having sales every other day. However, this shirt fits like a dream (true to size) and the fabric is remarkable soft. And it costs a mere £29.99. The main attraction of a light blue or chambray shirt is that you could dress it up or down. It's versatile and doesn't require masses of brain juice to think up ways of pairing it because it works with pretty much anything. Ideally, the outfit would look best with black ankle boots or gladiator heels but I have neither thanks to my ridiculously small feet (thanks mom and dad!) so I had to go with the next available option - my red 2 inch Louboutins that won't make me collapse in a heap (I've yet to attend Walking in Heels 101 course). A huge thank you to Lil L who after fierce negotiation received a reward of two scoops of ice cream for taking these photos. i need that chanel jacket! you look AMAZING!!!!!! Awesome styling. Awesome photography. Now can I borrow your lil L' please? I agree with you that Gap can be a bit boring some times but when they get it right, they do so get it right. 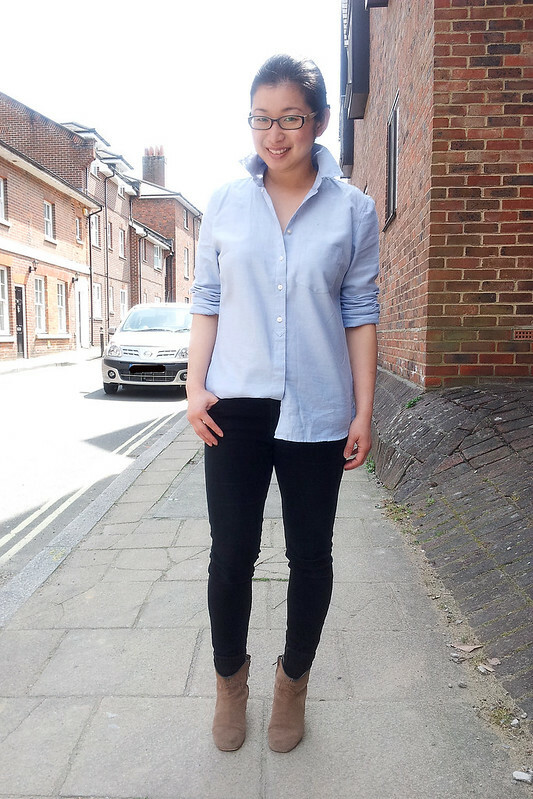 And I have the Gap perfect oxford shirt - love it. Very nice looks, I had my old one on yesterday and burst out of it! Must accept pre menopausal weight gain asap for sanity. I have the Gap perfect oxford in white and I love it - if you like good basics, Gap is pretty good. I love that shirt with the ankle boots! Lil L took good photo, you look very slim (not that you are not). I have a similar Oxford shirt too from some random local boutique(in fact I went google last night when I was reading Out of the Bag's archive), and she was talking about how she likes her shirt to be boxy and with no dart. Thanks so much, I Ying. So glad you've enjoyed reading my *ahem* ramblings (it's true....). I know, right?! In reality, I'm definitely a little pudgier but heck, those wide angle lens + Lil L's photography talent = skinny effect. You daughter is so talented if she can take pictures like these! I love both looks, such a good idea to pair a chambray shirt with a Chanel jacket! You look beautiful in both pictures! Love that half tucked in look. have ordered this shirt in the yellow, so may give it a go! Haha....the half tucked in look is actually to hide my tummy. The photo was taken right after a really heavy lunch. You look amazing but PLEASE can I have your jacket! I just ordered a chambray shirt from JCrew and now at least I know what to do with it. Annie, bet the Chanel will fit you perfectly :P You're welcome to try it on when we finally catch up for coffee. You look darling in your Chanel jacket. I find the colour quite flattering on you and the shirt makes the outfit young and stylish. Nice post! Catherine, I hardly ever wear bright colors yet surprisingly the red was rather flattering against my skin tone. You're absolutely right about that! Marlene, you looked so pretty in those pictures! Loved your outfit head to toe!